Kyndall Spires reaches up to hit the ball in Cardington’s Tuesday contest at Highland. Rob Hamilton | Morrow County Sentinel Highland's Raina Terry connects with a hit on Tuesday against Cardington. 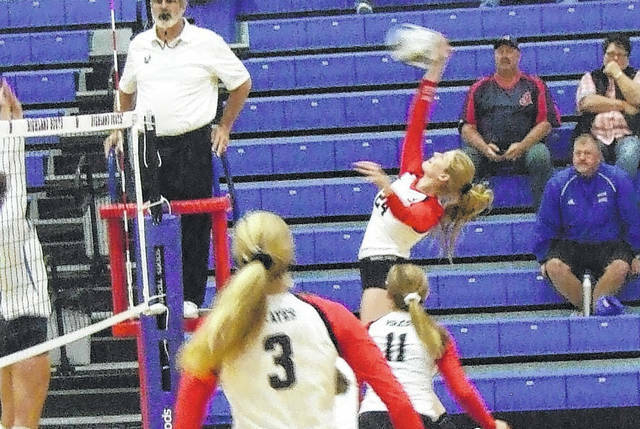 Cardington’s volleyball team got out to a great start against undefeated Highland in a Tuesday night Knox Morrow Athletic Conference contest, but the Scots were able to rally for a 25-21, 25-14, 25-12 win. The Pirates got on the board first with two points from Kyleigh Bonnette and added two from Rylie Partlow to take an early 5-1 lead. In front by an 8-5 margin, they would add two from Hannah Wickline and get an additional point by Paige Clinger to go up by a 12-6 margin. A big part of Cardington’s early success was strong play at the net, as they were able to block a number of Scot hits for points. Highland coach Rob Terrill noted that Cardington’s size did give his team trouble, but also felt his players just weren’t in the game in the early going. After falling behind by six, the Scots began a rally that pushed them into the lead. Parker Steck started with two points and Bailey Santo added one. Trailing 14-12, Highland got their first lead of the set after three straight points from Bridget Oder. Then, with a 16-15 advantage, they got one from Darcie Walters and two from Terry to jump in front 20-16. Neither team could string together points the rest of the way, leading to the Scots finishing the set winning by that same four-point margin. Highland got off to a fast start in the second. After Santo and Hannah Wickline traded a pair of points to open the set, the Scots got five straight by Krista Walters to jump in front 8-3. Cardington would fight back, getting four points by Clinger to turn a 12-8 deficit into a 12-all tie. The Pirates would not be able to maintain that momentum, though. Steck tallied one point for the Scots and then, with the score 15-13 in favor of Highland, they would get eight straight serves for scores by Santo to jump out to a 10-point lead on their way to going up 2-0 in the match. One point by Krista Walters and Terry and four from Makenna Belcher staked Highland to an early 10-3 lead. However, a defensive stop and four points by Wickline brought the Pirates within two. 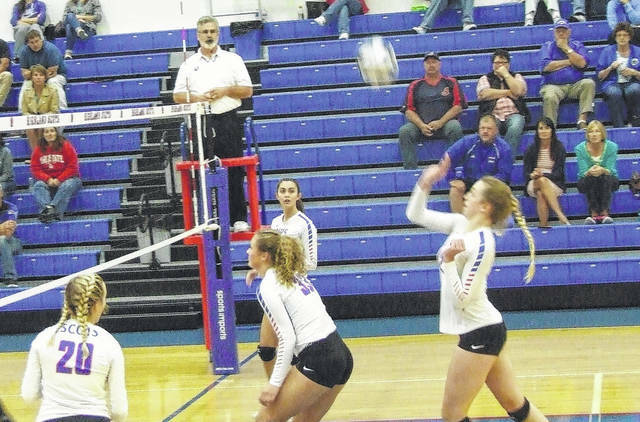 They would not be able to score offensively again in the match, though, and the Scots gradually pulled away for the sweep, getting four from Santo, two each from Oder and Krista Walters and one from Steck and Belcher. While Terrill would like to see a more consistent effort from his team, he admitted that he can’t complain about the end result. Highland’s Raina Terry connects with a hit on Tuesday against Cardington.